Lately, I have found myself staring at customers drifting away to a mountain range in an unknown land only to snap back to just to see two hateful eyes darting back at me while tapping the counter with their fingers or clicking a pen to hurry my pace. It makes me wonder, "When in the hell did we get in such a hurry?!!!?" I have noticed this in all facets of life-driving, talking on the phone, buying....well anything, I mean, we can't get the gas out of the pump fast enough to speed to wherever we are going that is soo important. How can we be actively engaged in our surroundings if we are constantly thinking about getting to the next check point on the "to-do" list? It is a good question, I know, and I have thought long and hard about it...the answer is fairly simple. JUST SLOW DOWN. We spend the majority of our time in our heads, think about it for a minute. Think about how much time a day you spend with someone other than yourself. Can you believe that you spend the majority of the time (in the presence of others) thinking about events, work, people, etc.?? Instead of actively engaging in conversations, remembering experiences, and recollecting information, we only half-way listening, half-way remembering, half-way recollecting the information that is ingested throughout our interactions. If you continued living your life that way, you would only be living a half-way life. If we took the time to stop, look, and listen; you would be amazed with the information you would acquire; the relationships you would develop; the experiences you would remember. In return being happy with your day knowing that you did everything wholeheartedly and embraced every moment that created your day. And at the end of the day, you would be surprised at how good you would feel because you would feel accomplished and fulfilled. All due to actively engaging in every interaction you encountered throughout the day. Because you never know who will meet, who you will impact, or what you will learn...simply...by being present. Don't let the worries of life cloud up a sunny day. 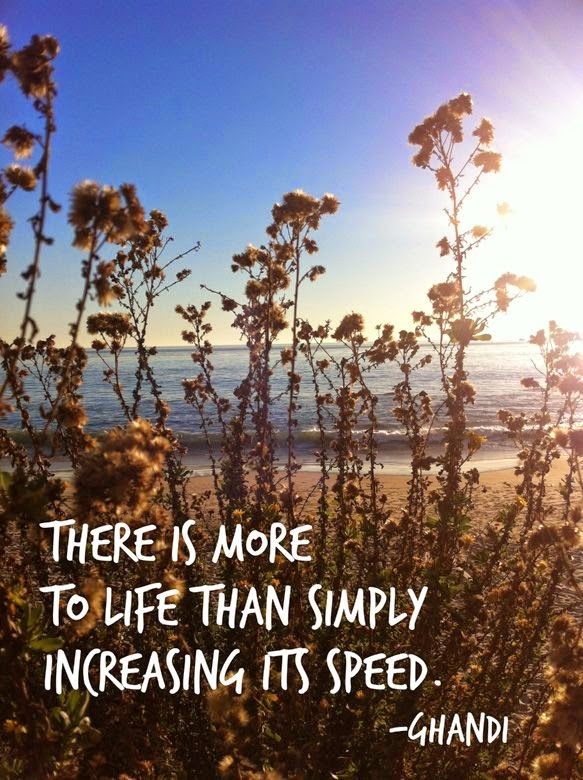 You control the pace of your life-slow down, and enjoy it.